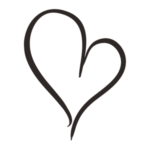 Hi friends and happy Wednesday – I hope your week is off to a great start! Before I jump into the topic of today’s post, I wanted to say thank you SO much, from the bottom of my heart, for all of your love and prayers following the passing of our sweet Franklin. We miss him more than words can say, but we are blessed beyond measure to have incredible family and friends in our corner, and that definitely includes you! Every day I look at his dog bowl or his bed or where he used to lay on the rug in the entry way, and as much as my heart aches to snuggle his little face one more time, I’m thankful he’s no longer struggling to breath, especially with the scary cold temperatures we are experiencing here in Omaha this week! Legit, today’s high is TWO! Two degrees with a windshield of -30! I can’t remember the last time we had such brutal, bone chilling temps. So in preparation for the Polar Vortex, Tony and I ran allllllll the errands on Sunday; including the grocery store, bank, post office, gas station, and one last stop for happy hour before we hibernate and wait out this frozen tundra. 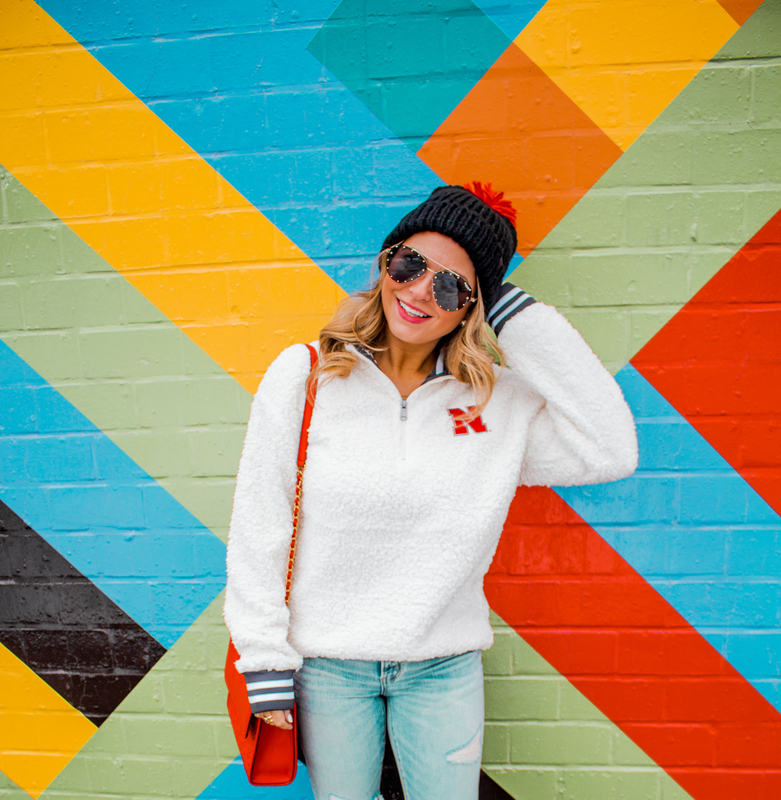 I definitely needed to be warm, but also needed a break from the leggings I had been wearing for three days straight haha, so I decided to bust out my Husker Sherpa and style it a bit differently than I normally would! 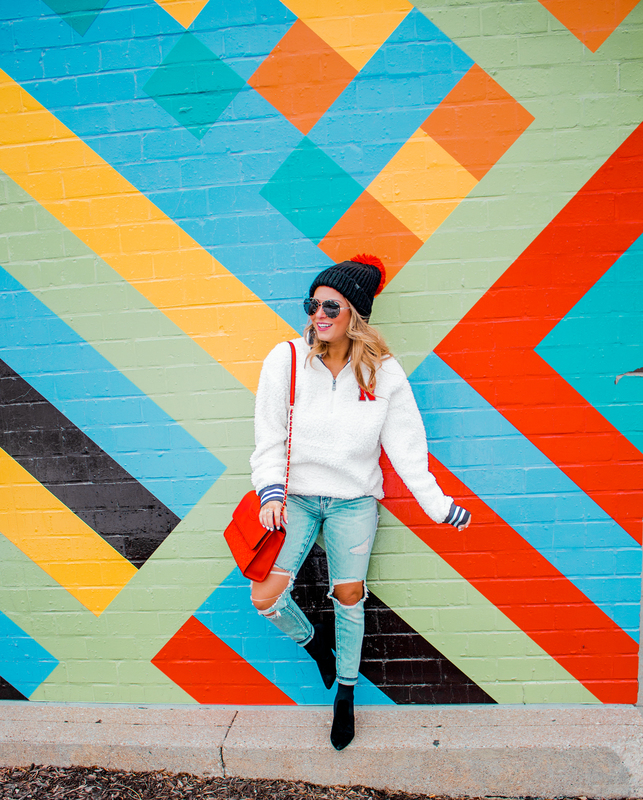 I definitely describe my personal style as dressed-up casual or causal with a twist, because for me, comfort is key, while still feeling confident and put together! 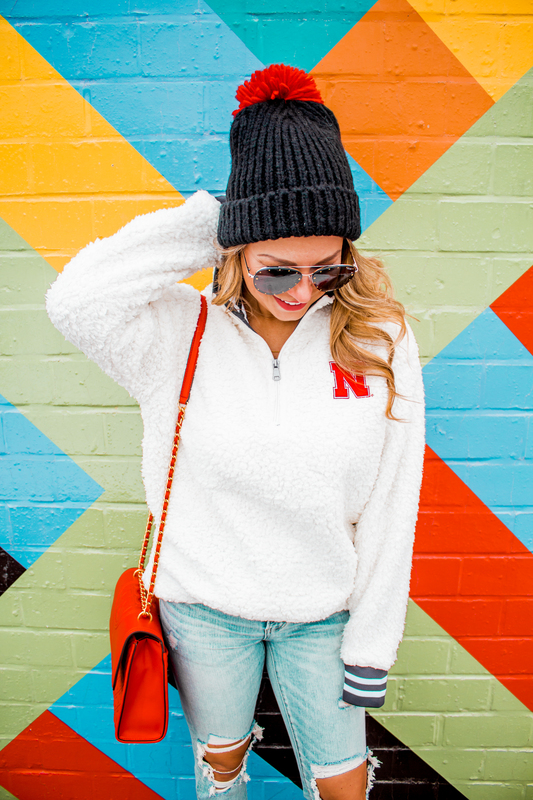 Rather than dressing down this ultra cozy quarter zip Sherpa pullover, I opted to dress it upa touch with these distressed jeans and a new pair of boots! I was perfectly comfortable, casual, and seasonally appropriate, but loved elevating this plush number with a few standout pieces! 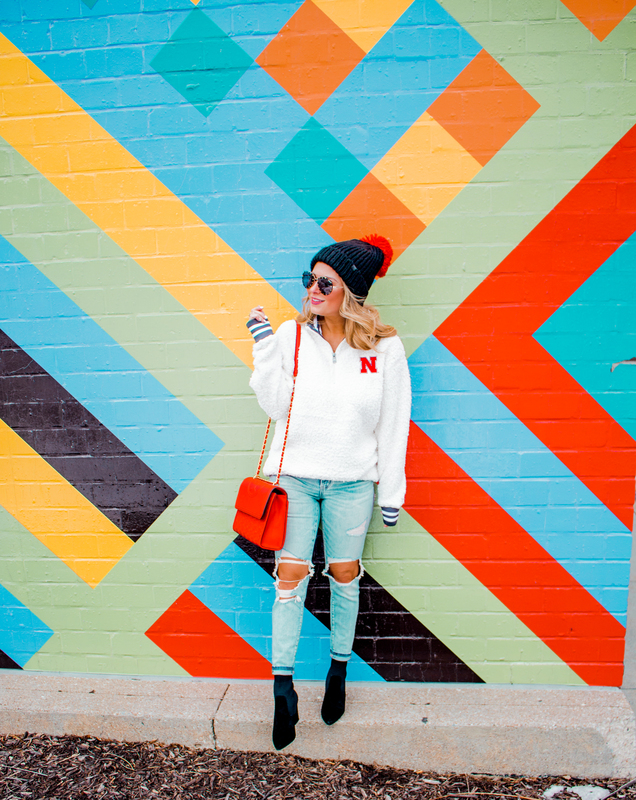 My red quilted cross body was the perfect touch to the bold red “N” and just happened to be a great match to my pom pom beanie! Who says you have to sacrifice cuteness for comfort?! If you follow me on Instagram, then you may recall that back in December, Tony and I took a little road trip to Lincoln, NE to pick up a few Christmas gifts for our favorite Husker fans! Being born and raised in Nebraska, naturally I’m a huge Husker football fan and so are my parents. My Dad’s birthday falls on Christmas Eve, so he gets double the presents and one of those is always a new piece of Husker gear. While visiting the Fan Store and the Scarlett Market inside the Pinnacle Bank Arena, we grabbed my dad a new polo, a couple engraved pint glasses, and picked up the cutest flannel shirt for my mom! Yes, we were there to buy gifts for others, but you girls know I had to pick out a little somethin’ somthin’ for myself! 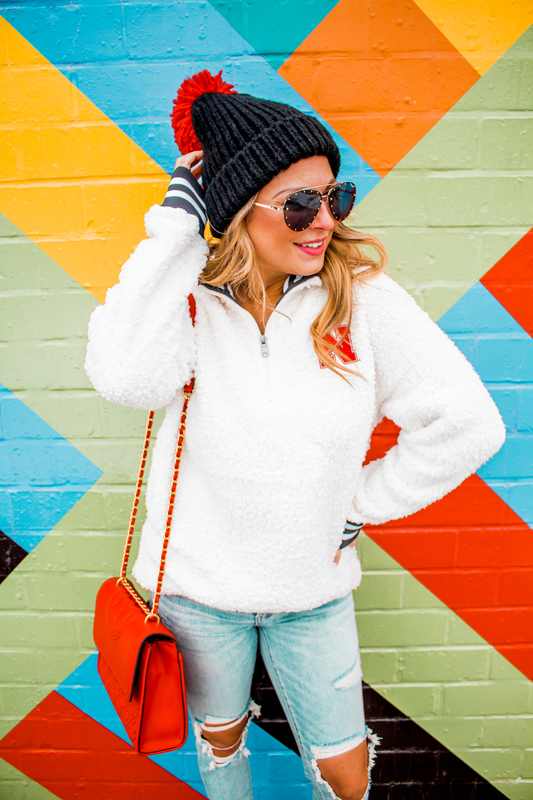 The only way to beat this frigid Winter weather is with cute and cozy outerwear, so I could not resist this cream Sherpa! I adore the black and white stripe detail on the sleeves and hem, as well as around the neck. 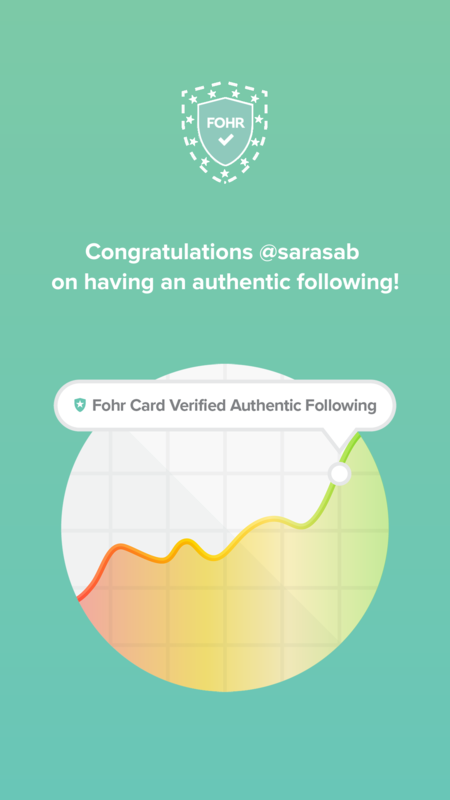 It gives it a little pizazz and you know I love my prints and patterns! 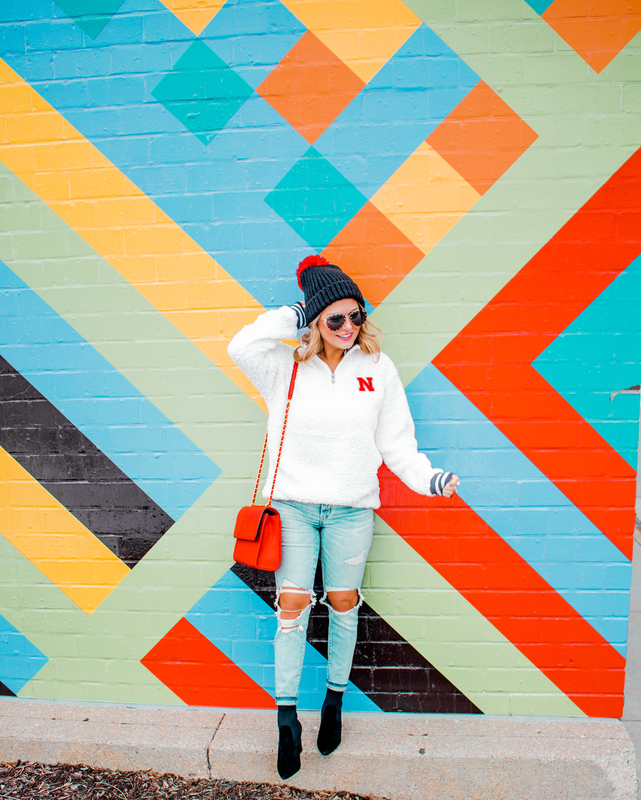 The bold “N” makes a statement and lets the world know I’m a proud Husker and Nebraska resident, but isn’t too loud; allowing me to style this pullover in a cool and casual way, even when it’s not game day! 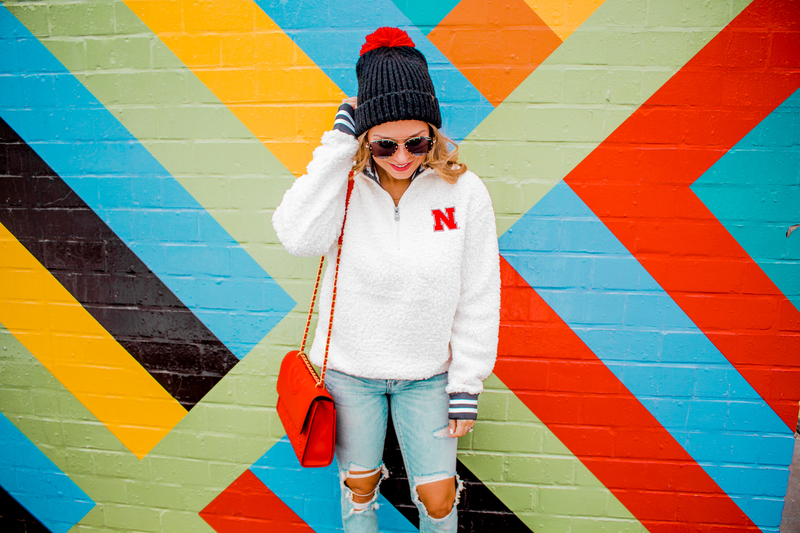 I’m a huge proponent of versatility and getting the most bang for your buck, which is why I love that I can wear this soft and warm Sherpa multiple ways! 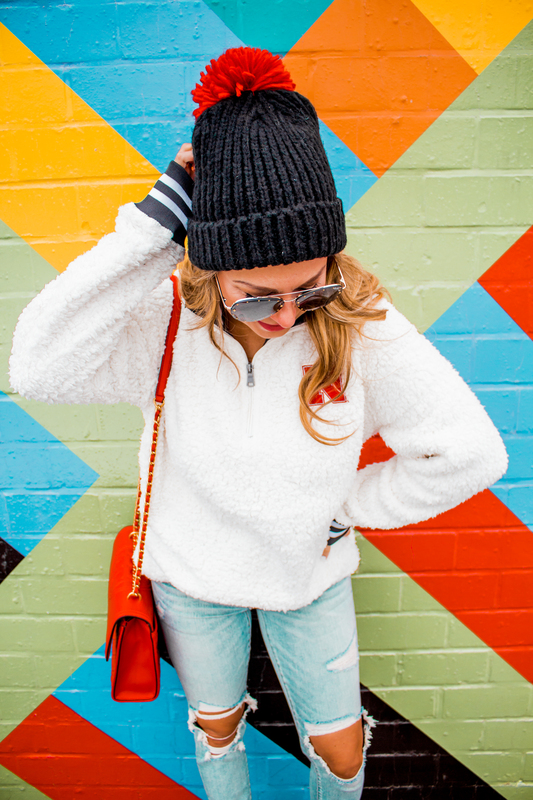 That is the cutest sherpa fleece!! I love those fluffy jackets and 3/4 zips. They’re sooo comfortable.